While americans have “March Madness”, the rest of the world has the “FIFA World Cup”. Yes, there a lot more teams involved in the NCAA National Championship but in the World Cup the element of surprise is also among the vibes of the game. While the collegiate tournament has 63 games to define a winner, the FIFA World Cup has 64 to crown a champion. Along the way in both tournaments, anything can happen. We’ve seen it plenty of times during March Madness, and we have already seen it in some of the first 11 games of the World Cup. The first one and probably the biggest one of them all was Netherlands crushing the defending World Champion 5-1. Colombia winning its first WC game against Greece 3-0 and Uruguay falling against Costa Rica after taking an early lead but finishing behind 3-1 on the scoreboard. Teams from North and South America had a perfect streak all the way until France avoided what could have been a huge upset if Honduras beat them. Even though only 11 of the 64 games have gone by, it is hard to think there is someone that has guessed correctly to the outcome of every game. Take into consideration that even soccer analysts say they are surprised by what they are seeing. Also consider the fact that in countries like Mexico networks dedicate 80% of their programing to the biggest soccer tournament that happens every four years, while publicity by companies is almost 100% related to the mentioned tournament. If the World Cup Results obeyed to the rankings FIFA has the teams in, it would be boring, no doubt about that. Spain would defend its crown, Germany would take silver just like in 2002, Brazil would fail in their attempt to win for the first time in their home by finishing third and Portugal, after barely getting in as a Wild Card would finish fourth (See FIFA Rankings). But Goldman Zachs sees the host nation as the winner followd by Germany and Argentina fighting for that second spot which is decided in two different games. Playing the World Cup final is not the same as playing for third. Spain was also set to find itself among the top three, but losing like it did against Netherlands now has it begging for fourth in many bets. Soccer star Neymar from Brazil along with Messi from Argentina are going neck and neck on the predictions to who will score the most goals. Messi after one game has one, Neymar took the lead with two but is tied with two Dutchmen (Robben and Van Persie) who scored four of the five goals in their opening game. Then there are also animals who predict winners. In the last edition of the soccer tournament “Paul the Octopus” predicted Spain as the winner and he got it right, but died after knowing he wouldn’t get any money for it. 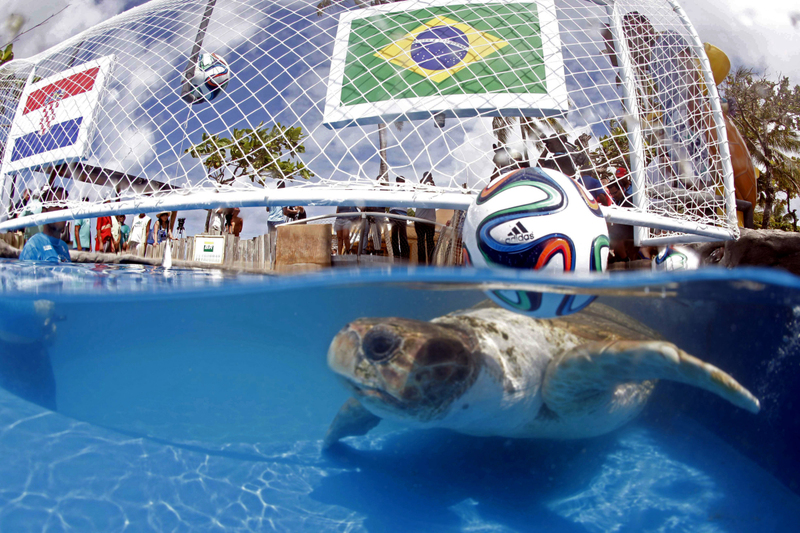 This time “Cabecao the Turtle” is taking his place and already got the first game right by choosing Brazil over Croatia. So if you like the art of either predicting or betting on a team, you are on for an exciting and probably bumpy ride through the FIFA World Cup of Brazil 2014.